Today, we’re going to have a little Rooibos fit clinic. 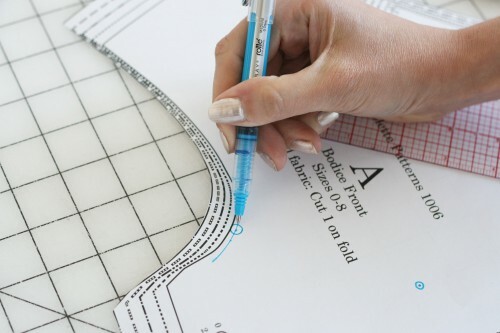 We’ll be covering three of the most common pattern adjustments, including full bust, small bust, and large hips. 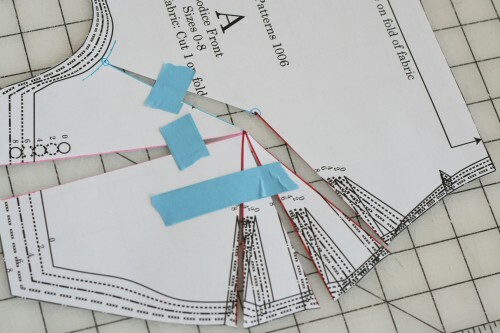 We’ll start with one of the most popular, doing a Full Bust Adjustment (or FBA for short) with the Rooibos pattern. How do I know if I need a Full Bust Adjustment? By now, you should have a muslin in made up in your size. When you try on the muslin, take a close look at the bust area. Do you notice any tightness around the bust? Is there strain, indicated by tight wrinkles across the chest? This probably means you need an FBA. Since our pattern block is drafted for a C cup, if you are much bigger than that in the bust, you may need an FBA. 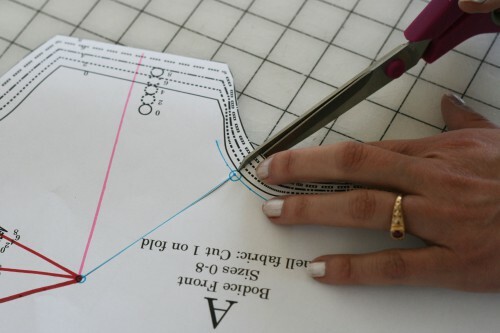 A Full Bust Adjustment is a way of modifying a pattern to allow for more fullness around the bust. In other words, it doesn’t make the rest of the dress bigger or smaller, it just adds room around the curves of the breasts. For a small bust adjustment, check out this tutorial. 1. At this point, you’ve already tried on your muslin and determined that you need more room at the bust, right? You should have also marked your bust line, bust apex, waist, and hip. 2. Cut the muslin straight down the center front, all the way to the hem. Put the muslin on again and adjust it until there is a comfortable amount of room at the bust. Measure the distance of the gap at the bustline, in line with your apex. Divide this number by two to figure out how much you want to add on each side of the bust. Write down this measurement. 3. 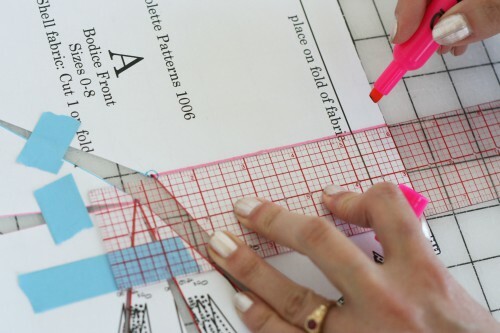 Transfer the apex point to your pattern piece. Here, you can see we’ve marked the apex with a small circle with a dot in the middle. 4. 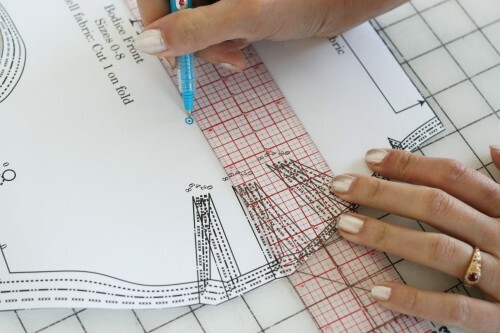 Now we’re going to draw in a seam allowance along the deep curve of the armscye. 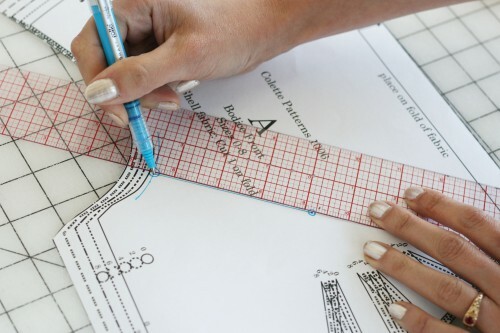 Use a French curve to draw 5/8″ seam allowance just along this part of the curve. 5. Choose a point along this curve and mark it. This will be your pivot point. You can see we’ve marked it with another circle. 6. Draw a line from the apex point to the armscye pivot point. 7. Draw lines from the center of each dart to the apex (ours are drawn in red). Normally, when you do an FBA, you simply draw one line from the dart to the apex. Since we have three darts here, we’re going to divide the fullness amongst all three. Also, if you can’t get your lines to go right through the tip of the dart, don’t worry! Just start them in the middle of the dart at the seam, and end at the apex point. You’ll be redrawing the darts later. 8. Draw a line from the apex point to the side seam (our line is pink). 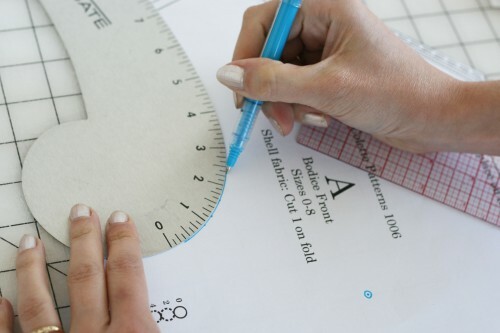 With a ruler make sure that the line is perpendicular to the center front. Your piece should look something like this. 9. Cut along the first dart (red) line, up through the apex, and ending at the armscye point. 10. 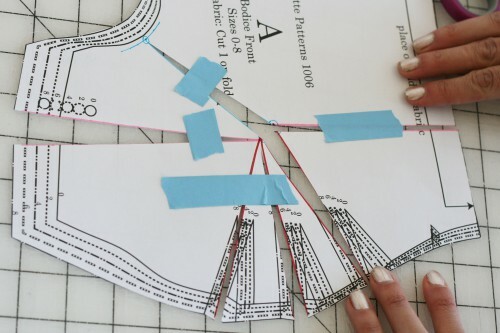 Snip the seam allowance to the armscye point. Make sure you leave a hinge by snipping close to the point but not through it. 11. Cut the side seam line to the apex. Leave a hinge at the apex. 12. Cut the remaining marked dart lines up to the apex point. Leave a hinge. 13. Move apex apart by the measured fullness from Step 2. For this example we used 1/2″. Allow the hinge at the side bust to spread as you move the pieces apart. You can keep the bottom left piece stationary, moving the other pieces around it until you get the desired extra width at the apex. 14. Spread darts an equal distance so that they’re about the same width between the legs. Tape all openings to hold them in place. 15. Draw a line perpendicular from the center front to the apex. 16. Cut the line you just drew. Move the piece down so that it’s in line with the bottom edge of the pattern and tape in place. 17. Tape a piece of scrap paper beneath the pattern. Smooth the edges by cutting along the bottom. 18. Mark the dart point between dart legs. They’ll be the same height as before but wider since the pattern has changed. 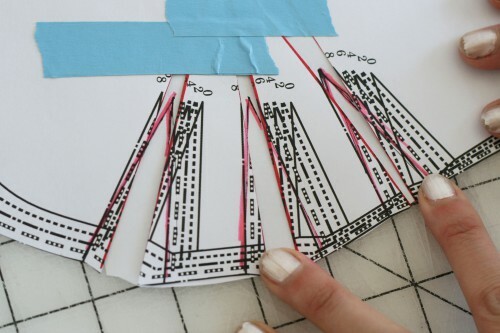 Measure each dart leg and make sure they’re the same length, so that they’ll easily fold together. 19. Finally we’re going to add a bust dart at the side. Yes, we’re adding a dart, which means the design line of the dress will change slightly. However, with a larger bust, the added bust dart will help you get a much better fit through the bust area. To start, tape a scrap of paper under the opening at the side bust. 20. Mark the tip of the bust dart about 1 1/2″ from the apex. Draw new dart legs connecting this point to the edges of the opening, as shown in pink. 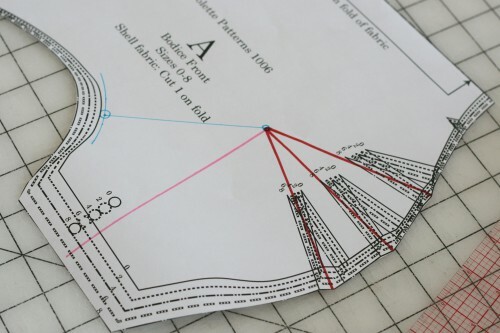 Now you’re ready to sew the adjusted pattern! Remember to take your time as you go! Breaks are definitely helpful. If you get stuck, take a breather and come back to it later. Let us know what questions you have in the comment section, we’ll try to help as best as we can! These alterations tutorials, and sew a long are great!!! Has anyone yet drafted a sleeve pattern for Rooibos? Lack of a sleeve is what has stopped me from joining in the fun. I already have, way too many sleeveless patterns in my collection. Other than that I LOVE, absolutely adore the dress, and re-consider my decision to abstain, every day. We’ve had a few requests about this, Gail! I’m not sure we can fit it in for the sewalong, but I think it would be a great general tutorial to add later on. Wow! I’m glad I practiced the FBA on Sorbetto first. I’m also glad I read your detailed and clear instructions before I tried a more complicated pattern. Thanks for this, it’s really really helpful. This is so helpful, thanks! A related problem I often have is that my measurements usually conform to the pattern sizing, but my bust is fuller than the pattern allows even if the measurement matches. Does that make sense? I guess it’s that the pattern is allowing for a smaller cup size though the bust measurement matches. I don’t know quite what to do about this and so I end up avoiding patterns with fitted busts. I’ll try this technique and see if it addresses my issue, as it does seem that the modified pattern piece allows more fullness. I think adding the side bust dart could really help with the fit for those of us with larger busts. I may do this myself. Can you please clarify if the apex that you marked in step 3 is supposed to be the original bust point on the pattern, or if it is supposed to be my measured bust point? 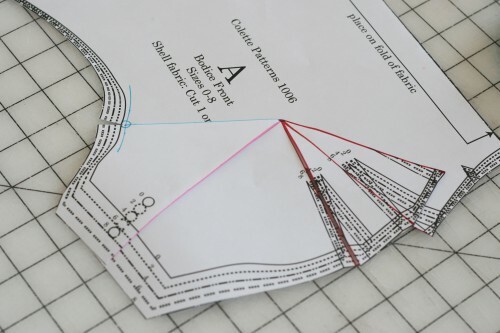 if it is my measured bust point, I am a little bit confused about how to figure out the mark on the pattern if I have sliced the muslin up the front and opened it. Thank you so much for this FBA. With slight modifications, I really think this will solve my fitting challenges on almost all patterns! I am wondering, though, if the pic above step 19 is a duplicate? I’m trying to master that added dart. Argh. I’m having trouble because my bust apex is low, in fact below where the three darts begin, so I can’t bisect the three darts properly. Maybe I’ll play with some shoulder adjustments tomorrow and see if it helps. I understand this right up until the end–I think that the picture for 19 is the same as the picture for 16, and there’s no picture for step 20. How does this project end, visually? Thank you so much for this very distinct directions for various pattern needs for all of us out here who aren’t size 0,1,2. My GGD needs a fancy dress in Feb. 2012 and she is tiny with this huge bust Now I believe I will be able to get her fitted. Bust size has never been a problem with us before. Thanks again so much. Thanks for these fab instructions for the Rooibos. I would love to make it with a lengthened bodice so the waist hits plus pattern mutilation to accommodate a 32H bust. I am first attempting the oolong, and wonder if you could offer insight as to what adjustments pattern-wise and yardage-wise I should expect if I want to accommodate my measurements, lengthen the sleeves to 3/4 length, and dip the hemline just below the knee. Thank you Sarai for this great tutorial. 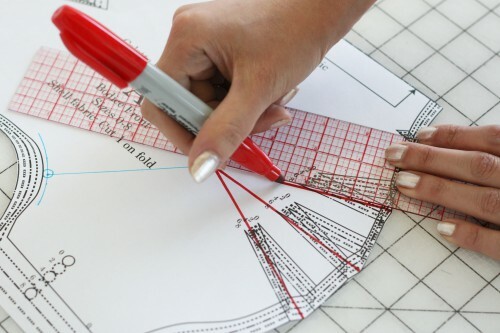 Yet another reason to love your patterns! Whoops, just read the byline, so my thanks goes to Caitlin of course. And all of you at Colette. Thanks for this tutorial. I just have one question- i have yet done the full adjustment yet but.. the math part of me is perplexed by this method. While i fully understand how this tutorial explains expansion of suface area(in all 3 dimensions- since darts in sewing patterns seem to follow the concept of vector- that of 3D calculus(and topology)- ie. Apex point being equivalent to that of min/max – the highest point on a curvature surface plane- thus adjustment in all Y, X and Z axis are adjusted- as it goes through the point of min/max). 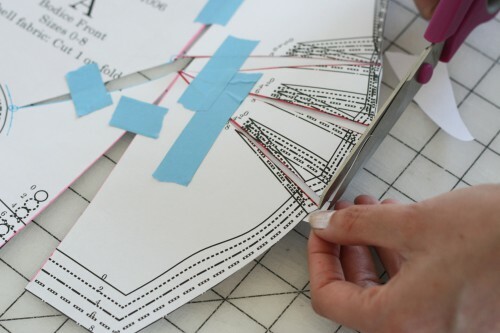 However, do we not need to do anything to the back bodice pattern piece? Because in this FBA tutorial, if i understand correctly, we are piviot and spreading(along it’s corresponding planes). 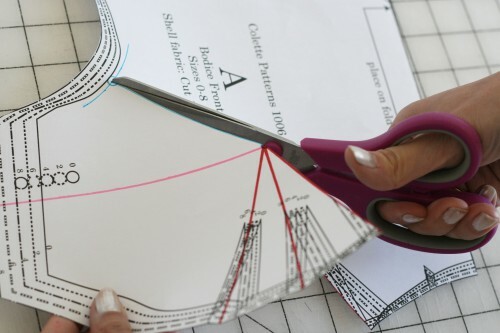 And by spreading the drawn/cut lines, Are you not effectively changing the arc length of this portion of the curvature(the breast adjustment area of the front bodice pattern piece). So the radius of this part of curve/circle is longer now– which effects the “section of the curve- it’s arc length(- i.e. similar to that of “section of the circle circumference) . If so, do we NOT need to “lengthen” the back bodice piece’s corresponding/joining portion of the side seam line? i see that by pivoting- the raised armhole(sleeve hole) dimension in length has not changed. But what of the side portion(the z plane section of the bust)? Is the portion increased in arc length entirely absorbed by the “new insertion of the side bust dart”? What if we did NOT add additional NEW side bust dart and only adjusted on side under bust darts by adding width? 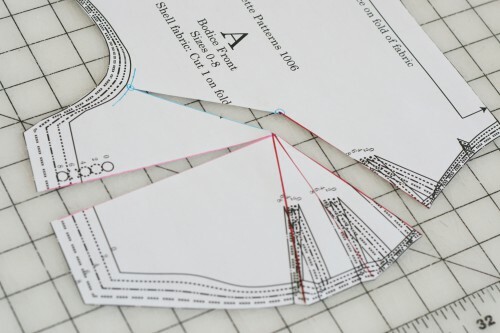 if then, Would we have to lengthen the side seam length of the back bodice piece, as well? I am sorry for sounding so dry and stiff. I am a newbie and if you yet noticed, um… things tend to register in my brain in numbers- as math – when i see these things(especially patterns- since it’s going 3D to 2D). I love the tutorial- easy to follow. I just hope someone could clarify this part of confusion!! 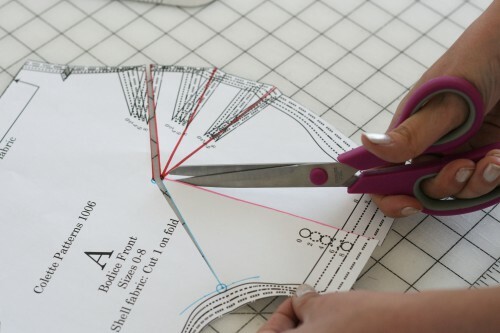 It’ll be so helpful b/c then, I can apply this tutorial to other colette patterns i just purchased and adopt accordingly. I am not good at just following direction without understanding exactly why- for every step of the way(kill me- i know — i sound so boring). But if anyone could please clarify why the back bodice piece need NOT be adjusted in length so the sideseam line would match the adjusted front piece, I’d really appreciate it. BTW- I love colette patterns and it’s forum support. Back does not need to be lengthened because once the darts are sewn (shut), the fullness has been taken out of the seam lines.